Ather Sharif was on his way to becoming a software engineer, when a car accident changed his life forever. He survived the crash, but now has tetraplegia. Ather has not let this hold him back one bit. Born and raised in Pakistan, Ather began his career as a software engineer there but soon decided he wanted to attend graduate school in the states and transferred to the University of North Dakota in 2012. You might be thinking, Pakistan to North Dakota?! but Ather quickly acclimated to life in the chilly Midwest and even met his girlfriend, Justine, there. As their relationship blossomed, Justine would spend some time in North Dakota with Ather on a visitor visa and then head back to her native France. On March 14, 2013, Ather welcomed Justine for one of her many visits. It started out like any other. The very next day, though, his life changed forever when a car accident left him tetraplegic. At the time of his injury, Ather admits “I didn’t even know what SCI was.” When it was time to choose a rehabilitation hospital, Ather picked Magee. He entered inpatient therapy in April 2013 and was discharged that July, transitioning to Day Rehab, Outpatient, and eventually the Wellness program. 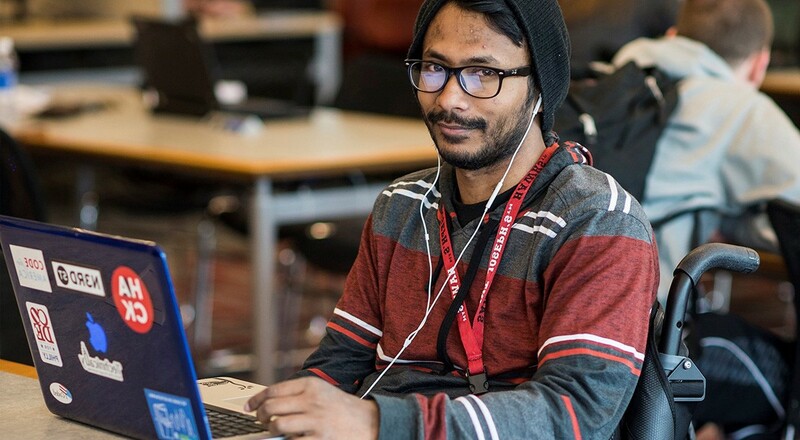 Ather worked extremely hard to regain his independence, and today, he’s using his skills as a software engineer to change the way people with disabilities experience the web. In January, Ather launched EvoXLabs, a non-profit run completely on volunteer power that aims to provide people with vision impairment an improved web experience. EvoXLabs also creates modern, accessible websites and apps for local nonprofits, free of charge. Ather didn’t have to go far to find their first client: Legal Clinic for the Disabled, housed on the 2nd floor at Magee. At this year’s Philly Tech Week, with attendees numbering 25,000+, EvoXLabs hosted evoHaX – a programming contest inviting college students to develop web accessibility solutions in a 24-hour “hackathon.” Another passion project for Ather is the SCI Video Blog, offering visual demonstrations of daily life activities for people with spinal cord injuries. In an effort to be a global resource, the SCI Video Blog hosts content in various languages. Ather hopes to renovate the blog very soon to make it the online hub for people with physical disabilities. Since his injury, Ather’s has also found time to be a guest speaker at the Hack4Access Hackathon; joined Unlock Philly, an organization to improve facility and transit accessibility; and even was invited to attend the 24th International World Wide Web Conference in Florence, Italy. “When you stop complaining and whining, it helps you come back to life,” Ather says.